So it begins, folks. The second novel. The new adventure. Every once in a long while, I wake to the world as it is. Every once in a long while, a veil lifts, and I see the little ruts that have been dragging at my footsteps, guiding my path by centimeters and by finger widths until I find myself miles from the distant point on the horizon where I thought that I’d been headed. Every once in a long while, I stop asking myself why I’ve not been writing, why my kids aren’t sleeping, why my heart is pounding, and I jump. It doesn’t always go well. With writing, most particularly, the first few forays back into discipline and exercise are painful, exhausting, producing almost nothing I can stand to read. Reestablishing healthy routines with my children often goes much the same way, for the first three days or so. And there’s a very, very good reason for the fecundity of exercise plans, diet regimes, and self-help guides available on the internet these days: we none of us care for ourself very well at all. I propose the same goes for any discipline which we have relaxed and seek to restore. Restoration is a messy, exhausting, often painful business. We know the good things that come at the end of long days of discipline. But we’ve been enjoying too well the gluttonous indulgences and laziness that seem to cost so much less, in the short run. But then, every once in a long while. We wake. We see. We leap. On an average day, perhaps tomorrow, in an average British town, in an unremarkable city square, a stone figure of a man appears. It isn’t carted in by performers, it isn’t theatrically unveiled, it isn’t dropped from the upper atmosphere in a terrifying lightning bolt or a dazzling display of lights. One moment it isn’t there, the next, it is. So simply and so silently does it appear, only a few people notice it. But then the statue stands erect. Two hours later, it begins to walk. And nothing – and no one – can stop it. What is a government supposed to do when a stone monolith walks steadily and inexorably through the country? It demolishes buildings and bridges and civilians who get in its way. It cannot be blown up or lifted or diverted or even slowed down. What does it want? Who sent it? And when will the blasted thing stop? Just lucky enough to be on the scene of the Stone Man’s arrival, a washed up reporter named Andy Pointer follows the walking apocalypse in hopes of securing a career-making story, only to discover that he is more intimately connected to the statue’s story than he’d like. What the Stone Man wants, where it stops, what it does when it reaches its destination… the horror of the Stone Man grows with each passing hour. And Andy can only try to stay one step ahead. The Stone Man caught me by complete surprise. It added greatly to the story that I listened to this book, narrated by an expert story-teller with a killer accent (Matt Addis), because the format of the narrative was a journal recorded on a dictaphone, told from the perspective of acutely detail oriented Andy Pointer. The excruciating tension and deeply rooted horror of this story got into my bones. I found myself camping out in my driveway, unable to turn off the car or interrupt the story long enough to switch to my headphones and walk inside. So effective was this tension, in fact, that I often grew impatient with the narrator’s minute details and laborious explanations of the facts. “I get it, I get it, move on!” I shouted. Literally, I shouted. Whether this was because Luke Smitherd has mastered the art of not disclosing all the facts until the very end or because he should have cut about half of the narrator’s inner monologue, I have no idea. I do know that nothing could have stopped me from getting to the conclusion of this book. The conclusion, as it was, turned out to be more of a question than all the pages that preceded it. I’m a long standing lover of science fiction, so unresolved conclusions aren’t too irksome for me. They’re preferable, actually, to those endings which work too hard to tie up the various strings of a complicated story. The ending Smitherd chose finished on exactly the sort of horror I prefer: the horror of the mysterious, the unknown, the unresolved, rather than gore or perversion or extravagance. There’s plenty of gore in The Stone Man. Consider yourself warned. But every incident serves the purpose of the whole. And in my humble reader’s opinion, that is almost always worth the trip. I’ve been reading a lot of nonfiction lately. It’s not the usual trend for me. I have almost always read exclusively fiction; mainly novels, really; mainly 19th century novels out of Europe. I know. Time to branch out. Now that I’ve dabbled in the genre somewhat demeaningly labeled “self-help” I find myself more and more addicted to books which address issues I’ve always struggled mightily and farsically to manage through my own wit and strength. The three books which have caused the deepest tremors in the foundations of how I operate in every day life are How to Raise an Emotionally Intelligent Child by John Gotten and Joan Declaire, Boundaries: When to Say Yes, How to Say No to Take Control of Your Life by Henry Cloud and John Townsend, and The Gifts of Imperfection: Let Go of Who You Think You’re Supposed to Be and Embrace Who You Are by Brene Brown. I bring up these three books because they’re awesome and you should read them all. I won’t review them here since my focus is fiction, but seriously. Drop what you’re doing and go read them. I also bring them up because each of these books is intricately connected to the success I’ve had in writing of late. I’ve gained insights into my own areas of emotional intelligence (and areas where intelligence is sorely lacking) and this has informed my characters and relationships in my fiction. I’ve benefited greatly from hearing about healthy and life-giving boundaries that “keep the bad out and let the good in”, instead of following the opposite pattern… MY usual pattern. And from Brene Brown’s Gifts of Imperfection, I’ve learned a brand new definition for hope, one which ties directly into a strategy I’ve been employing just to get words on the page in my life overrun with diapers and dishes and the myriad blessings of a quotidian life. 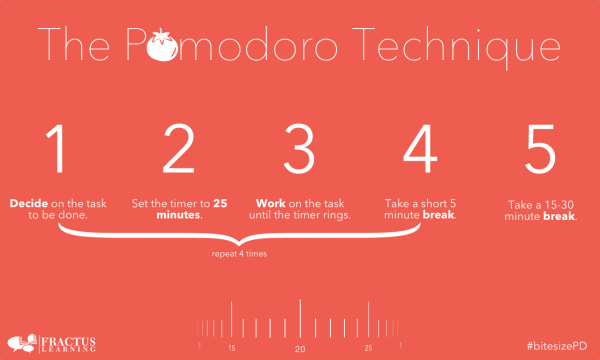 So now, the roundabout way, we finally come to it: The Pomodoro technique, a simple tool I discovered while surfing Facebook (See, Wormtongue? Facebook surfing does have its uses. (Note: I’ve named my inner critic Wormtongue.)). No matter what your work is, what your goals are, what tasks you set for yourself, this technique can be a very effective tool for motivating and sustaining your efforts. And as a very high bonus, this technique can also be an exercise in Hope. According to Brene Brown, hope is not an attitude but a practice. This practice is made up of three parts: 1. setting goals, 2. striving towards those goals with perseverance, and 3. believing our own adequacy and worthiness to achieve those goals. Hope can also be based on belief in the adequacy and worthiness of someone else, of course. My hope in heaven, for example, is not founded on my own adequacy or worthiness but on the adequacy and worthiness of someone else altogether. But the pattern stands. I set out to read and write this year, to make it part of my unconscious habits. I want to expand my palate and my knowledge by reading books outside my usual genres. I want to draw the connections between treatises on emotional intelligence and sci-fi space operas and odd literary exercises in introspection. And I want those connections to lend depth and maturity to my writing. All that after just three months. I look to the next 9 months with great excitement and renewed vigor and… Hope. One book at a time. One story at time. 25 minutes, then striving to rest. Keeping my eye and focusing my energy on only those things which challenge and drive and inspire me toward my heart’s desires. The world is indeed wide and weird and a wonder to behold.